ignore the fact that the charges were never signed (which makes them null and void) and they will ignore any and every law they are sworn to uphold. They will also claim that they treat all Pro-Se litigants the same way because they did not have a lawyer. They will also play the old Stalin card when their criminal efforts fail. We have already interviewed two other individuals they have done this to. 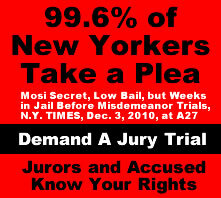 It is a clear RICO pattern and practice in New York. 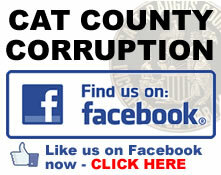 The Pro-se’s 1st amendment complaint originally started when he was falsely accused and was exposing a vast amount of criminal conduct by the Catt County DA’s Office. He was beaten and knocked by a Sheriffs Deputy who has been sued in federal court for the same type of conduct and perjury as well. When he asked why he was treated differently by the District Attorney’s Office because he did not have a lawyer, he was told by one of it’s members (‘ADA’ Kelly Balcom) that they “We’re treating you the same we treat every pro se individual who comes before us.” The term “us” is plural in nature, meaning she is stating that the district attorneys office treats all pro-se persons the same… The most worrisome facts about this statement is found below [transcript dated December 3rd, 2014, page 13, lines 22 through 23]. This is the most telling and outrageous statement ever made in the annals of law. 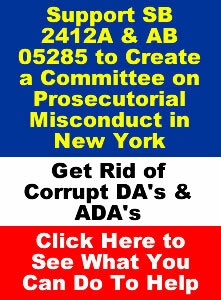 By this statement, law enforcement in the state of New York, proclaim that they routinely commit exceptionally serious misconduct upon pro-se persons, are severely biased and engage in personal vendettas against pro-se persons and in most cases Courts/Judges refused to act upon it. Is it any wonder why the US only has 5% of the worlds population and 25% of the worlds population in prisoners? The Pro-Se filed an Omnibus Motion in early July, 2014, based on the prior court’s pre-trial conference hearing that occurred in late June. At this hearing the parties to the matter, i.e. 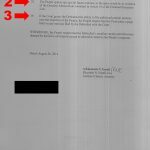 the District Attorney, and the Pro Se agreed that the DA would be allowed 45 days to respond to any motion that the Pro Se would file. The court agreed to it also. The Pro Se served his Omnibus motion in early July. The 45 Days came and went, no response to the Pro Se Omnibus Motion. 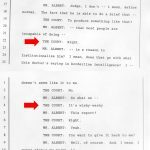 In late August at the 2nd pre-trial conference hearing in 2014, well after the time the DA could serve and file a response to the Pro Se’s Omnibus motion, DA Rieman sent two ADA’s (Balcom and Ensell) in to argue against ONE Pro-se individual. 2 against 1, now that’s fair, ain’t it? They also force upon the Pro Se their Response, again well after the time allowed. This was just one of the many ambushes the the criminal Lori Rieman and her flunkie’s committed in this matter. This was of course in violation of the New York Lawyer’s Code of Professional Responsibility DR 7-102 [1200.33][A]. Their answer contained one of the most blatant examples of just how corrupt the District Attorney’s office is. The ADA would claim that it was illegal for the Pro-Se to file anymore motions pursuant to a law that does not exist. Transcript where the District Attorney’s Office admits that they treat all people who represent themselves this way. Not only that, but at the December 3rd, 2014 action “ADA” Kelly Balcom asked for a 730.30 motion against the Pro-Se. 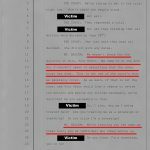 The transcript clearly showed that the judge would not even entertain the thought. He completely ignored it. She would also lie and claim that the DA was not involved with most of the matter they only came in at the end. This was another complete lie by her, the DA’s office was present at all of the actions that they normally show up at. 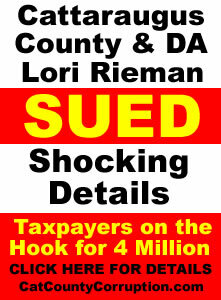 However, the completely corrupt DA’s Office would not stop there, the top criminal in the county, William Preston Marshall, AKA Baby Face Finster, would also demand a 730.30 motion at a later date after the Pro-Se slammed him on his lies and prior conduct that has led to a 4 million dollar lawsuit against the county (we the taxpayers) and also Rieman.A county judge actually ruled that his conduct was illegal. This is what they do in Cattaraugus County New York, if you are proving that they are completely corrupt and you are innocent. They will unlawfully and illegally use every means at their disposal in order to stop someone who is telling the truth, however, in doing so they are only creating a higher liability issue for we, the taxpayers. That’s us folks. 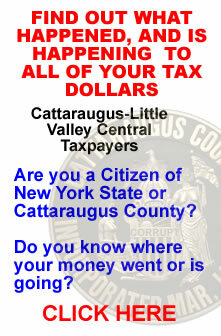 Is it any reason that New York State is now considered the most corrupt state in the US? On April 8th, 2015, the presiding judge in that matter ignored the fact that the three charges were not signed, therefore they were null and void and the one that was signed was was for obstruction of government administration for remaining silent. yes, that’s right, in Cattaraugus County New York it is illegal to remain silent when you are handcuffed to a chair and knocked out by a criminal masquerading as a sheriffs deputy, one Bryan H Schwabenbauer who has been sued in federal court for similar conduct and perjury as well. The court knew, or should have known they had no subject matter jurisdiction yet they completely ignored it. This court went on to schedule a trial one day before the Pro-Se’s birthday. They will always place their victims under the most stressful situations in an attempt to get their victims to capitulate to their criminal conduct. We have seen them practice this repeatedly, time and time again in this county. 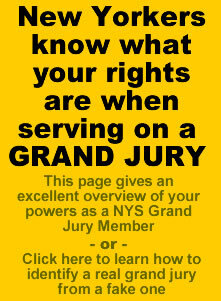 The more research you do, the easier and more apparent it will become to you that Rieman and/or her crew will even go to the Grand Jury and lie out her teeth to upgrade the charges in a attempt to get the victims of their criminal nature to plead out because they know the original charges are bogus. See how evil and corrupt they are? One really has to wonder what she is telling the Grand juries and who and how she is getting others to lie for her on the stand. 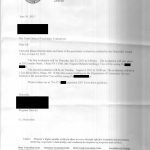 That in itself has already led to lawsuit against the Salamanca Police Department, which clearly showed she used Salamanca Police Officer Ronda Stanton Bush who was judged a perjurer by a county judge in that matter. We are working on numerous cases and one we have already posted (we already have others scheduled to be posted) concerning this serious issue. So the Pro-Se realizing that there was no hope in him getting any kind of justice prepared for trial which most likely would be rigged. After all it was “ADA” William Preston Marshall, AKA Baby Faced Finster, who was running the show now, the same one who’s conduct was ruled illegal which caused the four million dollar lawsuit against the county and Rieman personally and there was evidence he also rigged the jury in that matter that caused the lawsuit. Fair and just trial? Right. There is also evidence in the trial that led up to the lawsuit that Marshall rigged the jury. Back to the issue at hand; nothing else was scheduled at this time. The Judge refused to hear the Pro-Se motions at all, which is a complete violation of due process. What was also alarming is that a video was made of this action and court personal destroyed it and the law firm representing the court/town of Little Valley, i.e. Brandy & Swenson, would have the audacity to claim that the Pro Se had no rights what so ever to the tape. The law clearly shows otherwise. Motion for Recusal of the Judge which accused him of treason. This was the first time the prose had filed a motion to recuse on any judge in the matter. Three other judges had voluntary recused themselves from the matter which appears to be an historical first in the history of the New York State justice system. 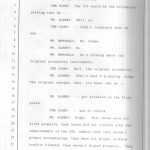 Further Rieman would go on and commit another crime by fraudulently filing a motion to change venue well outside the time allowed by law when the judges recused themselves. At this June 2015 action the Pro-Se filed all of the motions listed above and also served them on “The People.” As usual, the criminal FInster Baby claimed they were without merit, he did so with out even looking at them. In law that is called arbitrary and capricious. The judge at the time also ignored all of the motions, another act of arbitrary and capriciousness. So the Pro-Se stated that if the court was going to move unlawfully and illegally forward he would need subpoena’s. That’s when Baby Faced Finster started to cry out for a 730.30 motion. This was another attempt by the criminally minded district attorney’s office and her minions to shut the Pro-Se down for exercising his constitutional rights. Of course the judge agreed with the satanic criminal Marshall. However it was not clear if he actually order the exams because the Pro-se left and did not hear a word about it until he discovered the 730.30 order while reviewing the court files which is another violation of due process and after he filed his Article 78 in the Supreme court (which is the subject of another article). Jillian Koch, the court clerk failed again to do her job. To learn more about the criminal Koch click here, here and here. County Sheriffs Department. This is how they operate. The elements of one corrupt department helping the elements of another corrupt department. Coincidence you say? Well, lets take a look at the actual prima facie evidence. 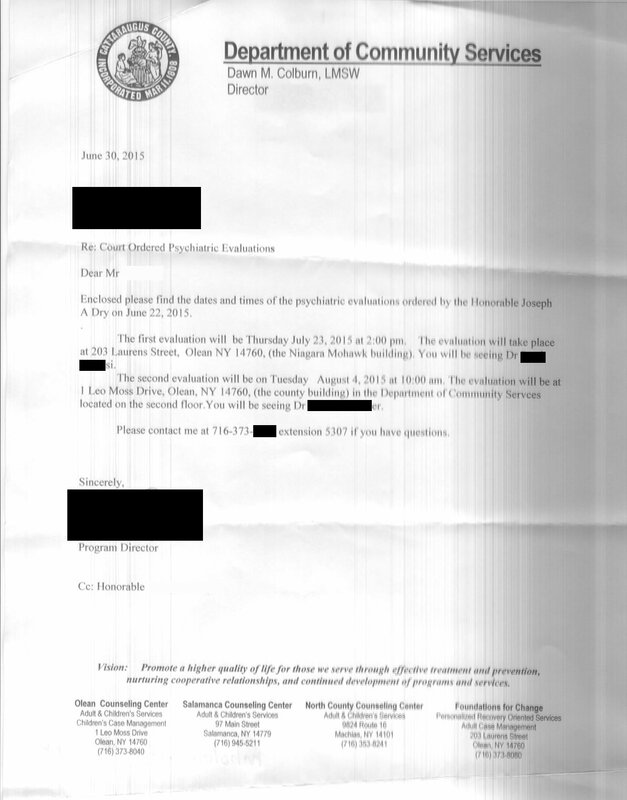 The notice/letter the Pro-Se received from Cattaraugus County Community Service’s had a date of June 20th, 2015. That would have provided more then enough time to prepare for the ‘exams’. 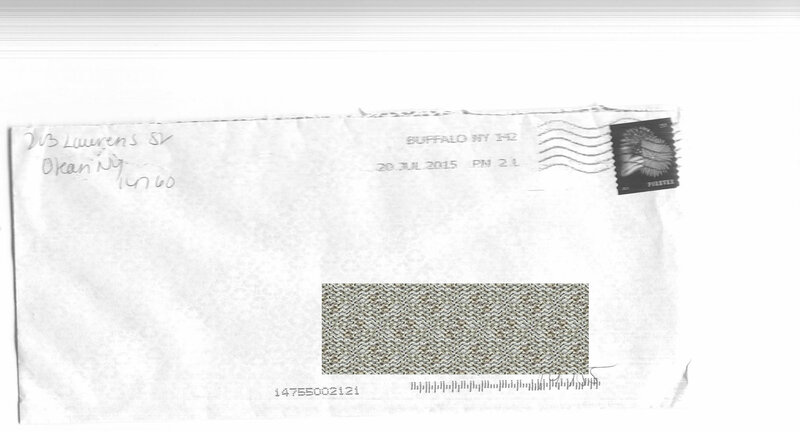 HOWEVER, the date on the envelope itself was postmarked July 20th, 2015. THREE DAYS BEFORE THE EXAM and ONE MONTH AFTER THE DATE OF THE LETTER. First class may go to Buffalo or Rochester before heading back to to a town in the same county. 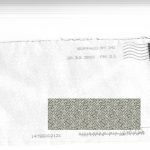 The post mark on the envelope bares this out, and by the way, we have prima facie evidence that the letter was contained in the envelope post marked on the 20th of July and it was processed in the afternoon also. The Pro-Se immediately called the Community Service Center and protested the denial of due process and because he had already had other things scheduled. The most interesting thing about his schedule and the ‘exam’ dates was the fact of the 2nd exam was on the same day he was to appear before the state panel on District Attorney Misconduct. See how it works folks? 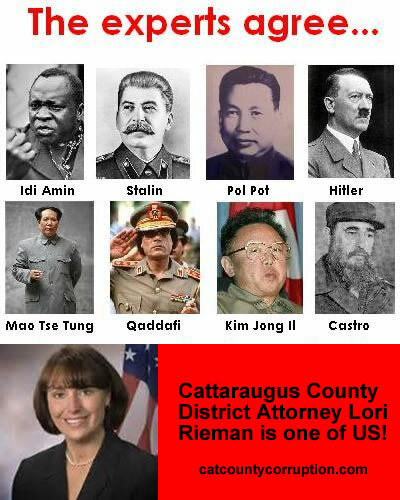 His acute understanding of the criminal mindset of the Criminally Corrupt Cattaraugus County government caught them by their own ropes, buy which they hung themselves by. Some call it ‘Karma’, and others ‘Justice’. So the Pro-Se realizing Community Service appeared to be conspiring with the criminals in the District Attorney’s office decided to research the two individual examiners, Dr. Shahnawaz Meer, MD and Syed Shamsi, MB BS. Meer has a 2.5 star rating out of four and Shamsi has a 1.0 for trust. Off to the inquisition the Pro-Se went. The first exam by Meer, lasted about 25 minutes, which the good doctor lied as to the time, In his report he stated it was one hour. Shamsi however did tell the truth as to the time it took. However both reports are filled with lies however that is the subject of a already completed article yet to be released. It was becoming painfully evident the the criminals in the county government were not going to follow the law in an manner, shape or form so the Pro-Se decided to enlist a incorruptible lawyer Matt Albert out of Buffalo. The next hearing date was set for December 1st, 2015. So the Pro-Se gets with his lawyer on the issues at hand and his lawyer agrees with the Pro-Se that the court lacked jurisdiction and that the 730.30 exam did not make any sense. His lawyer was impressed with the Pro-Se work. So December 1st rolls around and the Pro-Se shows up for the proceeding and sure enough there were three sheriffs there this time. Two with there cars idling in the parking lot just waiting to pounce on the Pro-Se. They were most likely called their by the criminal William Preston Marshall as a form of intimidation which he is really good at. And guess what, it’s another judge. This would be the fifth Judge that the Pro-Se was forced to be in front of. Looks like the Pro-se just broke his previous State Record record of three judges voluntarily recusing themselves. So the Pro-Se’s lawyer starts right off with demanding a hearing on the matter. The judge states that he just got it dropped on his lap and was not to familiar with the case, however he did have some time to briefly review it. He would go on and support the false claim by Marshall that the Pro-Se did not have the right for a hearing because the time expired for a hearing motion. There is nothing in CPL § 730.30 that limits the time for a motion for a hearing on a 730.30 final order of observation. The only place there is a 30 day time limit is if the pro-Se was committed involuntary past the final order of observation time. He would be allowed to demand a trial by a jury of his peers in the Supreme court, where he could show them the crimes of the DA’s Office and such. As a matter of fact CPL 730.30  is any party demands a hearing the court is mandated to have one. See how the criminals in the DA’s office use confusion in an attempt to misdirect the courts and defense? It appears to be the only thing they are good at. 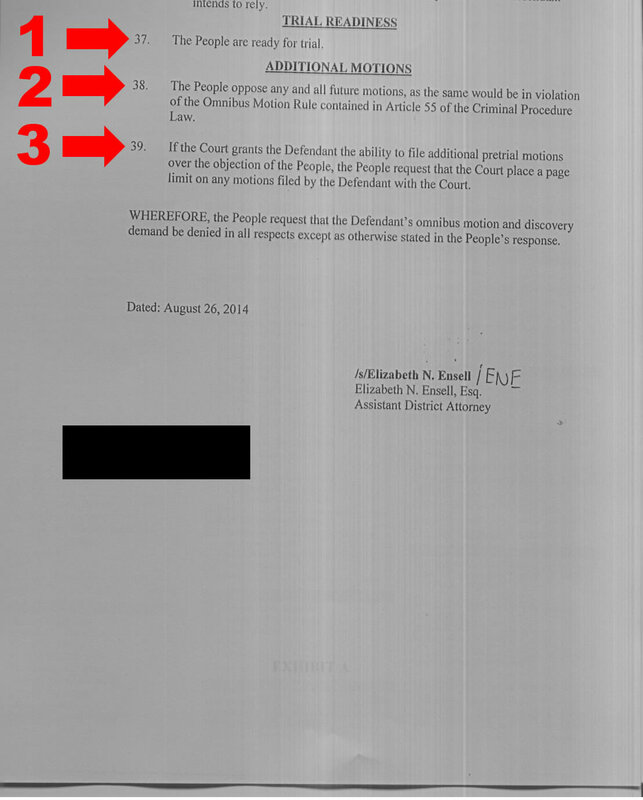 The Pro-Se’s lawyer also brings up the fact that that the pleadings are not signed and therefore are jurisdictionally invalid and the case is dead because of statutory time limits, which is not the fault of the Pro-Se, one example of this was when the criminal Rieman took 60 days before she filed a motion to change venue which was well outside the time limits prescribed buy law. But the criminal Marshall claims that it does not matter that the case must move on. 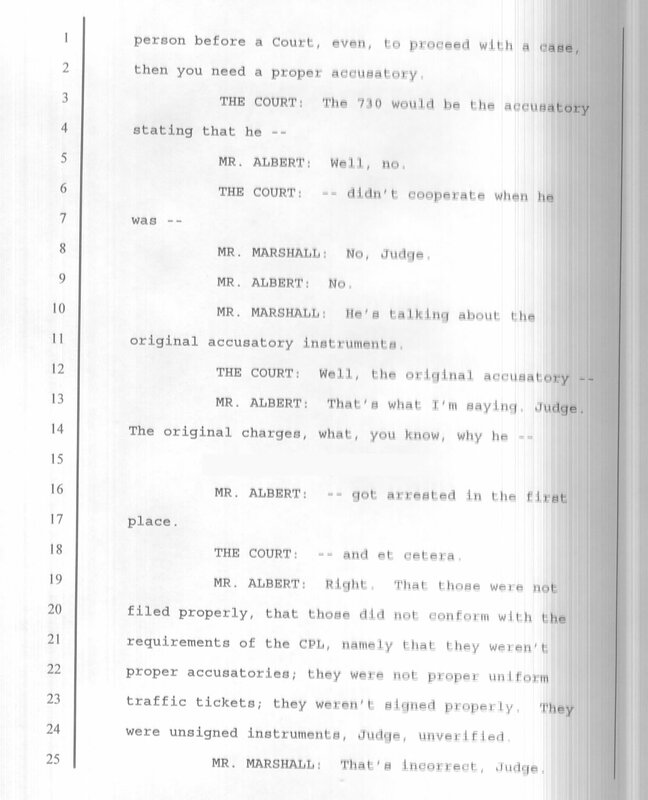 Here Marshall lies to the court again and the best part about it is the fact that the Pro-Se’s lawyer challenged jurisdiction thereby validating everything the Pro-Se has been stating from the beginning, which was the DA as well as the courts have no jurisdiction in the matter and the case must be dismissed. This issue is very important. It is considered a threshold issue and it must be determined before anything else can happen. Here are two good articles on the subject: article one and article two. 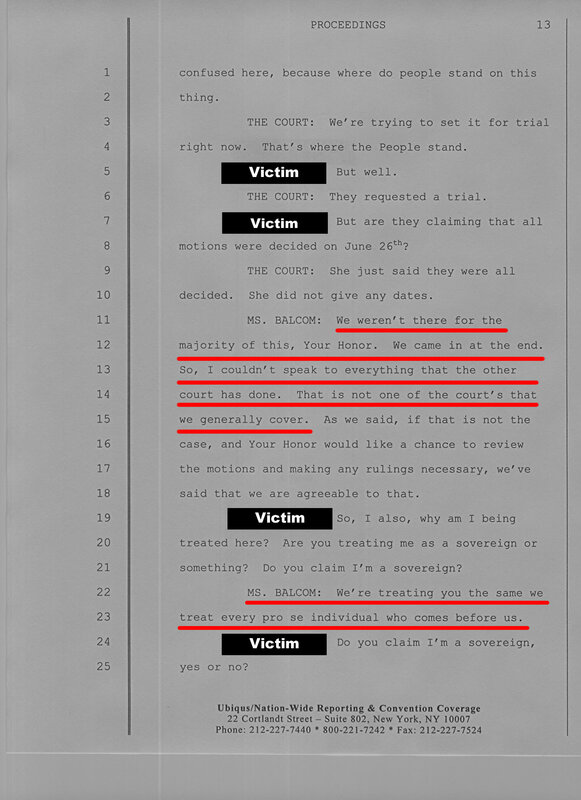 The Judge appeared confused by the criminal Marshall’s lies so he proceeds forward, he looks over the reports and he starts questioning the Pro-Se’s lawyer, he specifically hones in on the ‘intelligence’ aspect of the evaluation where the government lackey doctors claim the Pro-Se is of low intelligence and cannot understand the proceedings against him. The Pro-Se’s lawyer points out the fact the Pro-Se can recite law better then anyone he has worked with and goes on the state that most people are incapable of producing briefs like the pro-Se created. The judge agrees calling the reports the the government lackeys “wishy washy” (which is a term used a lot in the legal profession), so he lets the Pro-se get his own opinions by his own examiners and schedules a return on the new exams for late January 2016. 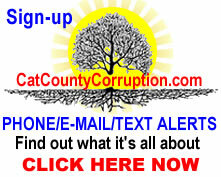 This entry was posted in Catt Co, Catt Co Important, Catt Co New and tagged ADA William Preston Marshall, balcom, bill marshall, Brady & Swenson, Bryan H Schwabenbauer, cattaraugus county, Cattaraugus County Community Service's, cattaraugus county corruption, Cattaraugus District Attorney, Community Service, corruption, grand jury, grand jury corruption, kelly balcom, Lori Rieman, new york, preston marshall, Ronda Stanton Bush, Sheriffs Department on December 22, 2015 by catcount.